Gay Marriage, Obama, and black voters: Why he is able to endorse it in a way a white Democratic president couldn’t. Why Obama is able to endorse gay marriage in a way a white Democratic president couldn’t. With that statement, President (and candidate) Obama advanced a cause that had been moving at geological speed until Vice President Joe Biden suddenly thrust the administration into support. Last time a presidential campaign jumped the gun on gay matters, Bill Clinton casually promised to end the exclusion of gays from the military in 1992. Although he didn’t lose that election, many analysts date the weakening of his administration from his losing battle to make good on that promise, culminating in the universally despised “don’t ask, don’t tell” policy. Twelve years later, after the Massachusetts Supreme Court issued the first gay marriage decision, African-American boxing promoter Don King toured the black churches of Ohio to gin up the Republican vote. The difference—the black vote went from 10 percent Republican to 17 percent Republican—arguably took the state and the 2004 election from John Kerry. Obama’s committed not to make the same mistake. After Vice President Biden grew feet and walked out of the warm sea on Meet the Press, Obama couldn’t duck anymore. But he’s not Bill Clinton, and he’s not John Kerry. Because he’s not white. And so he has a unique opportunity to move the gay issue along faster than anyone else could. Not so many people still remember, but it was an African-American, then Joint Chiefs of Staff Chairman Colin Powell, who killed Clinton’s effort to repeal the exclusion of gays from the military. Before Clinton raised the issue, the exclusion was a matter of Pentagon policy, which the executive could order changed—just as Harry Truman had ordered the military to integrate blacks. Indeed, Truman was the model for Clinton’s plans and the gays’ hopes. They thought the nation had learned its lesson about racial exclusion and that the heroic example of Truman’s early commitment to civil rights would empower Clinton to do the same thing. Those plans and hopes died when the shining star of the integrated military, Colin Powell, the first nonwhite chief of staff in history, denied that racial justice was an argument for gays. “Skin color,” the general wrote, “is a benign, non-behavioral characteristic. Sexual orientation is perhaps the most profound of human behavioral characteristics. Comparing the two is a convenient but invalid argument.” Repeal might have failed anyway, but once Powell took the stage to deny the racial analogy, it was dead on arrival. In the two decades after Powell spoke (and before he changed his mind in 2009), the gay revolution, unassisted by any president until this afternoon, undertook the task of changing peoples’ minds about the malignancy of their behavioral characteristic. Powell looked more and more like an ungrateful winner who wanted to pull the ladder up once he’d been admitted to the club. Gays came out, cared for their sick, served with honor, kissed on TV, and started Glee clubs. One small state at a time, they started squirreling away places to marry, until they took New York last June. The New York-centered media covered so many gay marriages, it gave rise to a gay movement to resist the rush to the altar. The latest polling reveals that white people are finally evenly divided on the issue of gay marriage. And nonwhites are similarly split. Liberal commentators use these facts to argue that race is irrelevant. But those numbers are not what matters. Anti-gay-marriage whites are not voting for Barack Obama. Forty-nine percent of white folks oppose gay marriage, but 74 percent of Republicans oppose gay marriage. And the Republican Party is almost entirely white. Where are the 48 percent of nonwhite voters who oppose gay marriage? Where are almost all nonwhite voters? In the Democratic Party. Even if every single black Republican is anti-gay, there simply aren’t enough of them to account for all the black anti-gay voters. Therein lies the danger for a Democratic candidate supporting gay marriage: that voters otherwise disposed to him will not support him because of his stance on gay marriage. And here is where Obama is different. If the black community doesn’t flood the polls, Obama will lose in November. But he’s the first black president of the United States. 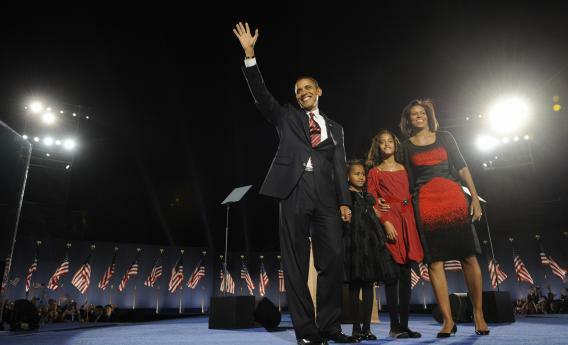 Black voters are sticky with Barack Obama in a way no white president could dream of. For whites, a white president is the natural order of things. For blacks, it was the miracle of Grant Park. Once the Iowa caucus happened, even Hillary Clinton, the wife of the “first black president,” could not stem the tide. As black houses went into foreclosure after 2008 and the unemployment rate went through the roof, Obama’s support among blacks stayed amazingly firm. As the election approaches, his support is at the same level as in 2008. A simple thought experiment reveals the issue: Try to imagine Don King in black churches exhorting congregations to vote against Barack Obama over gay marriage. Not going to happen. In this way, the president was uniquely suited among Democratic politicians to advance the issue (just as Powell could have done in 1993). Until today, Obama’s mealy-mouthed and harmful public statements on gay marriage looked suspiciously Powell-esque. But as happens now and then to Barack Obama, history gave him an opportunity no one else could seize, and he did.